I want to offer my own suggestion! The new possibilities of Unreal Engine 4 often prompt us to come up with something new, so the game could turn out to be as much exciting and visually enjoyable as possible. And recently we thought a lot about the appearance of units upgrades. We believe the mere yellowing or brightening or adding glowing effects is very outdated and it's time to make something new and more realistically looking. Behold, the example of heavy armor upgrade of Isengard warg riders! As the result of implementing such a system, all units that have an option to be upgraded with something of better quality, will leave their barracks or a respective building in more simple clothing, just chainmail armor or leather in some cases. But once upgraded, units will receive helmets, additional layer of clothing and sometimes even more, depending on the exact unit. 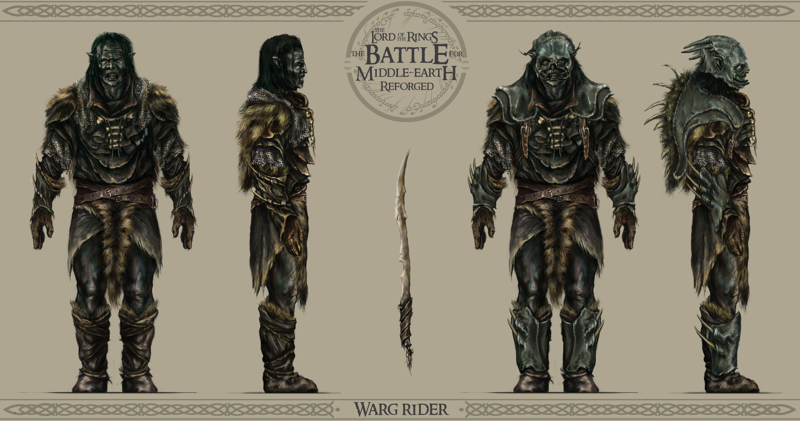 In case with these warg riders they leave warg cages without leather armor. Tough leather armor will make them visually different and much more durable in battle! We know that this might confuse many players at first, as no armor will ever glow as it used to be, yet we think a lot about the efficiency of the system, perhaps, we will add a possibility to see, if units are upgraded with a single sweep of a mouse above the unit or something similarly simple. You also may think that this idea is too much for an RTS game, yet a very successful real strategy game offers such a system, it's StarCraft II, and it's even an e-sport discipline! And after all, our artists will try their best to make very distinctive looks, so any upgrades won't confuse players at all! We want to ask you, if you like the idea of the new system or not. Or if you have even better ideas, ready to be shared! Choose any of the options above in the poll, share your thoughts about this! For me when it's about such a topic, player convenience comes first, realism second (that doesn't mean those two can't co-exist). As long as there is a clear visual distinction between armor and no armor and player colors are clearly visible then why not, sounds cool. Even though i actually liked the armor glow and/or change of color effect as it is clearly visible and adds a sense of danger to these upgraded troops. Also, sure you can add helmets for armor, but what about the visuals for weapon upgrades? It adds a little immersion which never hurts and satisfaction once you upgrade your troops. Think most of us know the feeling back in the other games once you have fully upgraded your army. So expanding on that has only positive results in my eyes! White it's easy to hate on this idea due to nostalgia, you'll have to remember this will look more realistic and people will learn the appearances of the different armor types after playing. I support this idea.